WHILE STILL at school, ubaba Andrew Mlangeni joined the South African Communist Party and the ANC Youth League, respectively. Relatively at the very young-age. These were the organizations that shaped his values and were to dominate his life, just like he moved from one place to another- seeking a job since he was not so much into school then. The Back Room Boy speaks. 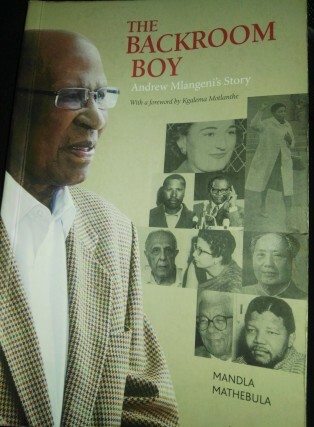 uBaba Andrew Mlangeni’s book touches the raw nerve and reveals a sensitive matter that he was labeled a ‘spy’. Image SLM. His latest book The Back Room Boy (Andrew Mlangeni’s story) outlines ubaba commitment to struggle for liberation and personal intersecting with ANC top structures from Nelson Mandela, Walter Sisulu, Inkosi Albert Luthuli, OR Tambo, Ahmed Kathrada, Ruth First, Dennis Goldberg, and so forth. The book also touches on him being labeled a ‘spy’ a moment he would like to forget as fast as possible. His upbringing was no different to any politician following detention, torturing, losing some of his family members and finally his honest but defiant ‘man of the house’ wife June. The Dube born Soweto (still resident) was part of the ever Six Members who received military training in China, before the formation of the Umkhonto We Sizwe but even after his release after 25 years’ on Robben Island, he was not given or appointed a senior position in the post –apartheid democratic government. “I was always a back room boy,” he says with conviction. Ubaba Mlangeni- ‘till this day a regular Golf player- as a result of him being a caddie at the very young age to eke out a living and scrape for cash- prompted him to have passion for this elite sport. During the book launch at the Green Jackets Awards Golf Ceremony held at the swanky Irene Country Lodge, ubaba Mlangeni gave a compelling autograph on the book he personally presented to me “I did what I did, not for myself but for the people of South Africa”, in company of grand-children and other family members. Thought provoking, heart-wrenching read -considering politics at that time- one must point out. The Back Room Boy is written by a Tsonga historian Mandla Mathebula. It is published by Wits University Press in partnership with June andAndrew Mlangeni Foundation and available at all leading book stores and oneBook. 2 Responses to "‘The Back Room Boy’ speaks and reveals sensitive subjects such as spy allegations leveled against ubaba Andrew Mlangeni"